"In less than an hour, aircraft from here will join others from around the world. And you will be launching the largest aerial battle in the history of mankind. "Mankind." That word should have new meaning for all of us today. We can't be consumed by our petty differences anymore. We will be united in our common interests. Perhaps it's fate that today is the Fourth of July, and you will once again be fighting for our freedom. Not from tyranny, oppression, or persecution, but from annihilation. We are fighting for our right to live. To exist. And should we win the day, the Fourth of July will no longer be known as an American holiday, but as the day the world declared in one voice: "We will not go quietly into the night!" We will not vanish without a fight! We're going to live on! We're going to survive! Today we celebrate our Independence Day! " - President Whitmore (Bill Pullman) delivers an historic address in Independence Day (1996). Independence Day (1996) remains one of the big “event” movies of the 1990s, a sci-fi blockbuster of monumental, almost unimaginable proportions. The crowd-pleasing film successfully tapped into the decade’s unending fascination with aliens and UFOs (The X-Files, for example) and significantly augmented that interest too, resulting in a slew of further alien films and TV programs from Dark Skies (1996) to Men in Black (1997). As an inside-the-industry cautionary tale, Independence Day also represented the (unfortunate) cementing of the Emmerich/Devlin blockbuster “formula” -- a revival of 1970s disaster film tropes. This format would meet its Waterloo in 1998’s Godzilla, but nonetheless continues right into this decade with films such as the dreadful 2012 (2010). Of all the Emmerich genre fare, I’m most fond of 1994’s Stargate, as it seems to strike the right balance between spectacle and intelligence. After that film’s release, the scales in further efforts kept tipping towards spectacle and away from brains, and so the ensuing films suffer mightily for the imbalance. That established, I was certainly part of the enthusiastic audience for Independence Day upon its summer release, and I still remember how great the film looked on the big screen. A recent re-watch confirms how terrific the miniature effects remain. The scenes of awesome alien saucers lumbering to position over major world cities -- though obviously reminiscent of Kenneth Johnson’s V (1984) -- remain downright staggering. What ages Independence Day most significantly, instead, is the pervasive shtick and the schmaltzy, sentimentality-drenched characters. At every step of the way during its narrative, Independence Day punctures its end-of-the-world majesty and gravitas with low humor and over-the-top sentimentality, qualities which today render the whole affair close to camp. Science fiction fans, of course, experienced conniption fits over Independence Day’s unlikely finale: a third act which sees an Earth-produced computer virus successfully uploaded to an alien computer aboard a mother-ship, thus giving humans the opportunity to strike back…on July 4th, no less. The movie doesn’t pay even lip service to the idea that aliens from another solar system might have developed anti-virus software (! ), let alone computer systems totally incompatible with our 20th century Earth technology. Given how badly things go for Earth in the first hour of Independence Day, it’s difficult to countenance the film’s final veer into outright fantasy as every heroic campaign – with split-second timing – comes together perfectly. Despite my misgivings about the film’s humor, sentimentality, and narrative resolution, however, I still find the grave, apocalyptic, anxiety-provoking tone of Independence Day’s first hour worthwhile, especially the President’s grim choice to deploy nuclear weapons in an American city to drive off the aliens. In terms of theme, Independence Day works overtime to remind all of us that although we are separated by oceans and other Earthly partitions, we are all nonetheless citizens of the same planet. It’s a laudable message in an age of hyper-partisanship to be certain, even if delivered with little nuance or subtlety. This through-line in the film is consistently and well-conveyed, both in terms of incident and in the make-up of the diverse dramatis personae. Who would have imagined our precious Earth could be saved by a war veteran, a drunk crop-duster, a Jewish cable repairman and an African-American fighter pilot? Honestly, I can see both sides of the critical equation in this case. Independence Day is such dumb fun, and yet fun nonetheless. The people of planet Earth watch with anxiety and wonder as three-dozen alien saucers descend from orbital space to take up positions over cities around the globe. President Whitmore (Bill Pullman), a former jet pilot in Desert Storm, advises calm, but new information from genius cable repair man David Levinson (Jeff Goldblum) suggests the alien ships have initiated a countdown and are preparing a coordinated attack. As the countdown ends, Levinson’s suspicions are confirmed, and the alien ships destroy Los Angeles, Washington D.C., New York and other population hubs. President Whitmore survives the attack on the Oval Office and escapes by Air Force One. He promptly orders a retaliatory strike. Pilot, top-gun, and would-be astronaut Steven Hiller (Will Smith) downs an alien ship during battle, and captures one of the fearsome aliens for study. The rest of the fight, however, is a rout, and the U.S. jets are unable to penetrate alien shields. Humanity stands upon the edge of extinction. The President visits the secret military base at Area 51, and learns there that scientists there have been experimenting with an alien ship for close to fifty years. When Hiller arrives, the President attempts to communicate with Hiller's captured alien, but finds the being implacably hostile. The aliens, he soon learns, are like locusts. They travel from solar system to solar system using up planetary systems and then moving on…leaving only carnage and waste in their wake. For a film about such a terrifying topic – an alien invasion – Independence Day frequently plays thing...light. At least a half-dozen major supporting characters in the film are defined by their shtick. Judd Hirsch plays a nagging Jewish Dad, Julius Levinson, and his lines and delivery are pure Borscht Belt ham-bone. Harvey Fierstein plays another kitschy character, Marty, who hams it up and makes jokes about his therapist and his (presumably overbearing...) mother. Harry Connick Jr. portrays a cocksure pilot who provides the film at least one dopey gay joke. But the worst character is likely Randy Quaid’s Russell Casse, a drunken crop-duster (and alien abductee) who joins the air battle against the aliens during the film's denouement. Quaid’s dialogue is so incredibly dreadful that it has become the stuff of legend and MST3K fodder. “I picked the wrong day to stop drinking,” springs immediately to mind. Among all these actors hamming it up and stealing time, Brent Spiner likely fares the best as aging ex-hippie and scientist Dr. Okun. Spiner comes off as weird and eccentric, but not so dreadfully hammy that you want to turn away from the screen in shame for watching. His last scene -- played with alien tentacles pressing against his larynx -- is also genuinely unsettling. Why do I have a problem with the film's pervasive moments of low humor? Well, Independence Day already boasts Jeff Goldblum and Will Smith continually cracking wise in leading roles. Their dialogue is dreadful too, from "Welcome to Earth" to "Now that's what I call a close encounter!" Given all this material from our leads, do we really need Judd Hirsch, Harvey Fierstein, Harry Connick Jr., Randy Quaid and even Brent Spiner dishing out lame one liners too? The ubiquitous nature of these characters makes Independence Day, at times, resemble an overblown sitcom. Maybe if the material were stronger, these characters would not seem so objectionable. I guess what I'm saying, is that these moments are rarely actually funny. Another weak character is Secretary of Defense Nimzicki (James Rebhorn), a man who in one scene advises the full scale nuking of many American cities, but in a later scene argues against a “risky” maneuver to attack the alien mother-ship and upload the virus. His objections to the (ultimately) successful plan make no sense, and aren’t consistent with the “war hawk” image he projects in the film all along; a guy who advises going to Def-Con 2 before the President has made his final decision. Instead, Nimzicki is contradictory simply so the audience can boo at him, and the President can dress him down…thus appearing tough and resolute. While I have real disdain for much of the writing and characterization in Independence Day, I do feel that the film's visuals often still shock, and often still carry real emotional resonance. One shot, set on July 3rd, reveals the Statue of Liberty toppled, face down in the harbor...a massive saucer hovering low in the sky. Colored in autumnal browns, this is a terrifying composition of American culture annihilated. It’s tough indeed to compete with the amazing Statue of Liberty imagery of Planet of the Apes, yet this moment in Independence Day remains quite upsetting. The film is also anxiety-provoking in the way it reveals American military might crushed before a more technologically-advanced enemy. The battle sequences, the nuclear option, and other heavy moments are all deeply scary because one realizes that if America can’t save the world…the world ain’t getting saved. Indeed, Independence Day plays up the alien threat so successfully in terms of spectacular visuals and special effects that there’s almost no way the scripted, climactic victory can ring true. It’s like we’ve slipped into an alternate movie or something. 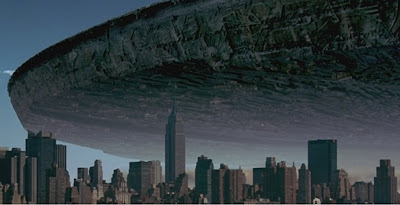 The first half of Independence Day is undeniably the strongest, as alien saucers push through storm and cloud fronts, and emerge over our cities, casting dark shadows upon bewildered and amazed populations. These moments continue to impress, and pack an almost visceral gut punch. We’ve all wondered if, one day, we’ll wake up to something like this imagery…a new dawn in which we learn definitively we are no longer alone. As much as I deride Independence Day’s silly humor and bad dialogue, I have no quibbles whatsoever with the way that these scenes of “arrival” are vetted. As I said in my introduction, many of these scenes still carry a staggering punch. From its first shots to its final ones, Independence Day also makes an interesting point about mankind being unified by a threat from the outside. The film opens with imagery of a plaque on the moon which reads “We came in peace for all mankind.” That’s a wonderful thought, the movie seems to suggest, but then the filmmakers set up a paradigm by which that hopeful expression of common cause is tested. Suddenly, all mankind must work together to defeat the alien threat, putting competition and petty differences aside. This idea is expressed through scenes set in Iraq, the location of America’s most recent war (Gulf War I). There, in the desert, British and Iraqi soldiers join the battle against the mother ships. The implication of such scenes is that mankind is indeed capable of working together. The same idea is presented in the film in the (positive) character of President Whitmore. Before the alien crisis, he is viewed not as a warrior, but as a “wimp.” He can’t even get his Crime Bill passed by a hostile Congress. Whitmore laments that “it’s just not simple, anymore” and that people don’t seem to understand that compromise is the only path towards moving everyone ahead, together. He then works with the nations of the world to defeat the aliens, and in the process transforms an American holiday into an Earth holiday. Again, the message implicit in Independence Day is that we can apply ourselves to solve big problems, not just alien invasions. Why can’t we all band together to keep our neighbors and our neighbors' children from starving? Or to eliminate poverty? Once we acknowledge our common humanity, petty partisan differences shouldn’t really matter, should they? In this sense, Independence Day -- set in part on July 4th -- acknowledges a new, evolved brand of patriotism. It is a patriotism not merely to party or to one nation, but to all of humanity. As a fan of Star Trek and a person who believes we can achieve great things if we sometimes accept compromise, I appreciate the film’s ultimate message of hope about human nature. This consistently-applied theme almost mollifies my concerns about the film’s ridiculous and ill-conceived conclusion, and the surfeit of characters who spew cliché after cliché, bad joke after bad joke. Almost, but not quite. Still, I know I'm spitting in the wind against an 800 million dollar blockbuster, a veritable entertainment machine. So am I a hopeless sentimental for recognizing Independence Day’s entertainment and social value, even amidst so many stupid groaners and moments of cynical, calculated humor? Or, like Randy Quaid's character...did I just pick the wrong day to stop drinking? I also watched the movie recently and have a fresh memory of it. The special effects, the build up of the first hour or so are tremendous, as you say. And the (not so A-list) actors deliver a strong performance. I found the small jokes entertaining, as a necessary counterpoint to the drama. I think it was an effort to keep it as light as possible, to keep it in the summer block buster range. Some of them are a bit too goofy, that's true, but I think the overall effect is OK.
And I think this tongue in cheek feel made me forgive the whole computer virus thing (unlike other movies that take themselves very seriously, and then throw the wrench in the engine when one least expects it). I hate this movie. That is all. I feel your pain. I understand why you feel that way. Independence Day is a film of great highs and terrible lows, in my opinion. I can see how one appreciates the former, and suffers through the latter. Nice review. INDEPENDENCE DAY has always been one of my guilty pleasures. There's nothing like a good alien invasion flick, although the 1953 adaptation of WAR OF THE WORLDS will always be my favorite. I also love alien invasion flicks. Describing Independence Day as a guilty pleasure is, I think, perfect. I'm a big fan of both editions (1953 and 2005) of War of the Worlds. I recall seeing this in the theater. I went purely and exclusively to watch the various buildings get particle-beamed into nothingness. So I was a fairly easy sell when it came to ID4. Within the first hour - I was thoroughly satisfied on the criteria of what I was seeking. I find I can put its failings aside though and just enjoy the camp. It's fairly harmless, it's not unpleasant, and it does have some good thoughts underneath the inch-thick cheesy icing. I put it on a couple of the bar TVs the other night when I was working for just that reason. I love your comment. "I went purely and exclusively to watch the various buildings get particle-beamed into nothingness." Seriously, ID4 nails this aspect of the alien-invasion sub-genre. We see landmarks and monuments fall, and they do so with glorious, frightening special effects. I agree with you that ID4 is quite powerful on this front. It's a special effects showcase and more than that: the moments leading up to the attack are emotionally gripping. I agree with all of your comments, but I still cannot bring myself to watch it a second time. The thing that especially bothered me was uploading the computer virus. I found it particularly funny that Goldblum was using a Mac since, in those pre-Imac days, there was virtually no compatibility between Macs and PCs, let alone using a Mac to connect with a completely alien technology. I get that it was a play on the whole War of the Wars virus thing, but still really stupid and unbelievable. Yes, I still marvel at the stupidity of the movie's resolution. I concur with you there. You may be correct that the filmmakers were attempting to update the War of the Worlds "virus" aspect, but jeez. It's just so stupid and far-fetched. I might have believed it a little more if some character had died in the attempt to upload the virus. I know that's probably not a nice thing to say. But I would have been willing, maybe, to accept the computer virus solution, if the trade-off was that the Goldblum and Will Smith characters died in the attempt. Then at least it wouldn't seem like such a get out of jail free card. It's a horrendously bad ending. I agree. John very honest review of the highs and lows of ID4. I liked the President(Bill Pullman)character giving the rally the troops speech before he himself climbs into a fighter cockpit, thus setting the example of putting his own life on the line. This movie was the ultimate product placement by Apple, buy a Mac and you might save the world. Though I guess it didn't increase Mac sales before Steve Jobs returned to save the company in '97. 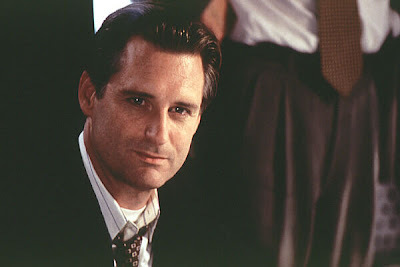 The Bill Pullman character, President Whitmore, represents my favorite human aspect of the film. I think that Pullman brings dignity and gravitas to the role, and as a patriot of this fine land, I get a lump in my throat each time I listen to his inspiring speech. He really does a great job in the film, especially since all those around him are camping it up. Pullman grounds the film with his performance, and in my opinion is ID4's MVP. Yes, it has weaknesses. But what draws me most to the film is its ties to many late 50s early-60s science finction novels, which also usually center on some global sort of disaster. Those ties are most evident in the makeup and movement of the characters. What starts in that first hour as a series of reactions by apparently unrelated characters slowly works towards all of those characters in the same place, pulling together. That's an interesting perspective, I think, and you're right about the overall flow of the film -- "apparently unrelated characters" come together "in the same place, pulling together." I can't disagree that this is the film's formula. However, I found it in keeping not so much with 1950s- early 1960s literary sci-fi as the 1970s disaster flicks, where a common location (a skyscraper, a ship, etc.) pulls diverse people together and forces them to reckon with looming crisis. Not saying you're wrong, or that those touches aren't there, just that I relate them to Irwin-Allen-ism of the disco decade. Which books in particular are you thinking of? A specific example might wash my mind of The Towering Inferno or Poseidon Adventure or -- argh -- The Swarm! The one that springs to mind is Leiber's 'The Wanderer', but there are many more in that time period. There are bits of it in the literary version of 'When Worlds Collide', even though msot of that story takes place after the characters come together. 'Lucifer's Hammer' is a more modern example, having been published in 1977. It may be just that I'm a bit older, and so the 'primary nerve' it hit was those novels, rather than the disaster flick (though I can certainly see the resemblance). The one difference I see between the 70's disaster flick and ID4 which takes it closer to those 60's novels is that the character groups in ID4 not only are not known to each other in the beginning, but are not in the same place. In those disaster movies, you rightly say that all the characters (except possibly some rescue personnel) are co-located, which gives them more commonality than the novels' characters. And in ID4 it's a nice touch, because at the beginning the viewer will try to figure out how each group might come together (there's no doubt that they will). How is the crop-duster going to fit in? What about the dancer, who is connected to the pilot, but then ends up connected to the First Lady? That is, in my mind, one of the better aspects of the plot. I'm so glad you returned with that additional information. I hate it when I miss a part of a film's context. So I appreciate very much you going into further detail. This adds to my understanding! Great examples from Leiber's canon that I had not thought about at all. I read "Lucifer's Hammer" long ago...it was a fixture in my public library in Glen Ridge, NJ, in the late 1970s-and-early 1980s, in a spinning rack like you'd find at a book store. I appreciate how you delineate the difference between the 1970s disaster flick and the novels. So there's kind of a sense of surprise in the novels about how all the characters are going to fit the story-line, assemble, and come together to resolve the conflict. That's very intriguing to me, and I had no idea ID4 conformed to this tenet of 1960s sci-fi literature. Thank you for adding meaningfully to the dialogue! You are more than fair in your assessment of Independence Day. Yes, it is indeed “schmaltzy” and full of “sentimentality-drenched characters”, but I don’t perceive these as being a detriment to the film. I’ve watched Independence Day more times than I care to admit, but at least once at the theater in 1996 and at least once every two or three years on DVD since then. What brings me back to the film are not the – still – amazing special effects, but the many wonderful characters in the film. For the most part, these are people that you really like and care about and therefor feel even more empathy with before some of their eventual deaths. Yes, some of the characters are a bit “ham-bone”; or dare I say stereotypical? The worst offender is David’s co-worker Marty Gilbert. I’m neither gay nor Jewish and I find his character insulting! I honestly don’t think that these characters are supposed to be real fleshed out human beings, so even poor Marty doesn’t ruin the fun of Independence Day for me. 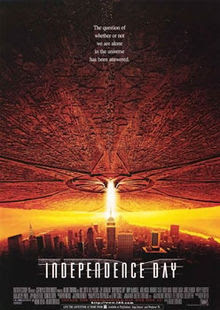 As far as I know, Emmerich or Devlin have never admitted this, but Independence Day to me is an obvious homage to the classic 1950’s sci-fi movies like: The Day the Earth Stood Still, The War of the Worlds, This Island Earth, Earth vs. the Flying Saucers, The 27th Day, Kronos, and not sop classics like: Killers from Space, Target Earth, It Conquered the World. It plays much like those films from their and my youth, so I can’t help but see Independence Day as anything more than a that; much like Lucas has admitted to Star Wars being a film that was inspired by his viewing of the Flash Gordon/Buck Rodgers serials from the 1930’s and ‘40’s. Science fiction fans sometimes really make me crazy! How can the idea of an Earth-produced computer virus successfully uploaded to an alien computer be any more unbelievable than a spaceship the size of New York City hovering over it without any apparent expulsion of thrust or even anti-gravitational field? Or for that matter, how these immense spaceships traveled hundreds of trillions of kilometers without once being detected by Earth astronomers? Nick-picking scientific plausibility in a film like Independence Day is purposeless, because the intent of the film is not one if scientific exposition, but one of pure entertainment! If we as science fiction fans spent all our time picking out the scientific inaccuracies of these films, we wouldn’t be able to enjoy any of them, because all science fiction films – and most literary science fiction for that matter – contain speculative aspects that are just plain wrong. I prefer to enjoy a science fiction film the same way I enjoy any film; if it tells a good story with likable characters than that is good enough for me. Keep up the great work defending our beloved genre, John! A stirring and important defense of Independence Day, here, my friend. I like how you contextualize the film in terms of alien invasion history, and also handle the question of science nit-picks. I've gotten to a place very analogous, myself, with nit-picking in sci fi. The ridiculous response to Prometheus -- death by a thousand nitpicks -- is what really got me. All that nitpicking can keep one from enjoying a film, and seeing its artistic virtue. That said, I feel the compatibility issue is a bit more than an nitpick. I think Gerry Anderson said it well regarding Isaac Asimov's critique of Space:1999 several decades ago. If we're talking about accuracy, things we know about -- like the lunar surface or computer viruses -- should be portrayed accurately. If we're talking about things we don't know much about -- alien worlds and alien saucers -- it's perfectly okay to speculate and invent even wild flights of fancy. I think the compatibility issue in ID4 tends to trip over that marker, that's all. I think I read somewhere that the incompatibility was actually addressed in a deleted scene in that they aliens had adapted their computers to work with ours in order to infiltrate our networks (and therefore it was backwards compatible as well), but my feeling about the whole problem is that if I am able to believe an oxygen destroyer can kill the original Godzilla (not to mention I'm still waiting to purchase my first Maser cannon), I can let this slide. One thing I can't let slide, and that I find pretty hilarious that you did not mention is 2 different instances in the movie in which characters mention alien abductions and area 51, and both are looked at like they are raving lunatics, even though most of the planet has been destroyed by aliens in the last 24 hours. I would think Randy Quaid's alien abduction story may have gained a bit of credence with the arrival of, you know, ALIENS, but everyone still looks at him like a nutball when he brings it up at the pilot's briefing. And everyone treats Julius like he has read too many weekly world News magazines when he bring up Area 51, despite the fact that the world is now teeming with alien craft. I suppose some attitudes never change though. You have offered two fascinating and intriguing insights here, BT, and I appreciate them both. If that one little detail about incompatibility had been left in the text of the film, ID4 would certainly have escaped much scorn in the last decade and a half. That one little perfectly sensible explanation really squares the circle, so far as I'm concerned. And you're right for pinpointing a plot hole there. You're right, everyone continues to treat Randy Quaid's character as nuts, even though his viewpoint has been more than validated. I don't know if this is an oversight, an attempt at humor, or just weak writing. But you make a fine critical point. Nice review, John! My wife and I went to see Independence Day at an old, historic theater in DC that had a larger screen than the typical. We had to wait about an hour in line, but it was worth every minute. You nailed the strengths and weaknesses of the film, particularly the lump-in-the-throat rallying speech and the ridiculous one-liners by (mostly) likeable characters. I like Jeff Goldblum, but he's kind of nailed that smart, agitated, questioning character and played it up in this film, Jurassic Park, Law & Order: CI, and currently in Glee. He's too much in Independence Day. Now that I think of it, maybe I just like him b/c he's from Pittsburgh. Great review John. I don't know how you have enough time in the day to watch and re-watch these films, write books, and keep up an astounding pace on the blog. But, as a reader, I appreciate it! There was great anticipation for this film, and ID4's visuals certainly don't disappoint, even today. I'm also a real sucker for those "kumbaya" moments where people of different ideologies, nationalities and points of view come together and overcome differences. I believe in unity through cooperation and consensus, and so the President's speech does give me a lump in my throat, no matter how often I watch it. Perhaps I feel this way because we don't see enough of these moments in real life. But you're right, all those moments work like gangbusters. I am also a big Goldblum fan. I love him in Jurassic Park, where he is used sort of as "spice" peppered over more stolid, less humorous characters (portrayed by Sam Neill, Laura Dern, Samuel L. Jackson, etc.). In Independence Day, there's a bit too much of that spice from the likes of Goldblum, Smith, Connick Jr., Fierstein, Hirsch, Quaid and more. I feel like the movie just needed to dial back the silly humor a bit. The result is that at times the film feels jokey or inconsequential, when in fact the narrative is enormously, globally consequential. Thank you for an excellent comment! I think it interesting that, while one of my predecessors in commenting on ID4 mentions that the film is an homage to George Pal's War of the Worlds, no one seems to have caught on to the apparent fact that it is actually a REMAKE of Pal's classic film! Set up both and play them side-by-side; many of the scenes and details are virtually the same, including the protective force-fields of the Martian/Alien ships, the failed nuke attacks by similar aircraft (a YB-49 in Pal's film and a B-2 Stealth Bomber in Emmerich's--both of these planes being "flying wing" designs! 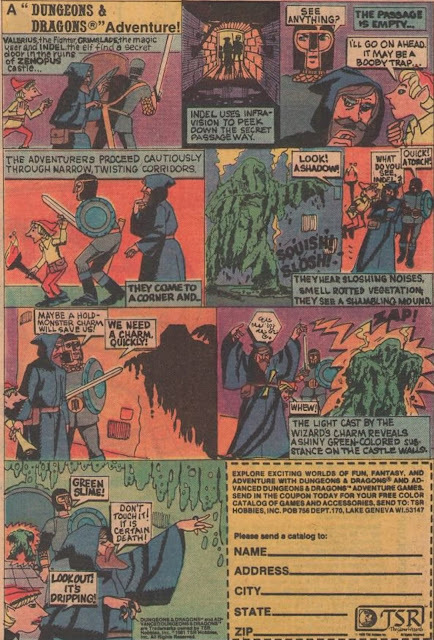 )the discussion of how to greet the invaders--"Welcome to California" vs. "Welcome to Earth" just before both Welcome Wagons are vaporized, the pilot delivering an intact bit of Martian/Alien tech to a secret lab (Pal has the scientists examining a Martian "eye", while Spiner's character is presented an alien in a protective suit to dissect). Check it out. I apologize for the quick-&-dirty note but I'm deployed in the Persian Gulf and have limited computer time. I enjoy your blog, when I can get it out here, and look forward to your comments (on my comments). I think "Independence Day" is definitely a fun flick, with staggering visuals at times, just like you point out, a stand out work with miniatures that to this day doesn't look fake or dated, but I think the cliché chacacters, horrid dialogue almost destroy the movie as a whole. The bad humor, the horrible dialogue, the incrediby dumb plan to take down the aliens at the end made me cringe ever since I saw it, and I was way younger than I am now obviously, and it is something to take notice when even at a young age, I was bothered by these elements. Now, there's been talk of a sequel (or sequels) to Independence Day. That is something that I can't help but get excited for, I mean, it is so intriguing and interesting to see how the world was rebuilt after the alien attacks, and of course, now that we know we are not alone in the universe, what impact would that have in on religion, politics, etc. What do you think? Should I be less excited, seeing as how I thought the first film wasn't all it could've been? You think these themes can be explored?